Snow in Panthertown Valley is always so beautiful. We have seen an exceptional amount of rain and snow in the valley this winter that has led to some road closings, fallen trees, and muddy trails. That’s why our volunteers are crucial in helping to keep the trails clear and safe for all to enjoy. We hope you will RSVP to join us at our next public trail work day on Saturday, March 23. The U.S. Forest Service has recently given us the green light to begin work on several important trail projects in Panthertown. Many volunteers will be needed to help us reroute the popular Wilderness Falls Trail to allow for safer access to view the waterfall. We will also be working with our volunteers to open up Carlton’s Way, a popular trail created by and named in honor of the late Carlton McNeill. For a more info about Carlton and the essential contributions he made, check out this great article from Forest Magazine: Ghosts of Panthertown (Winter 2010). 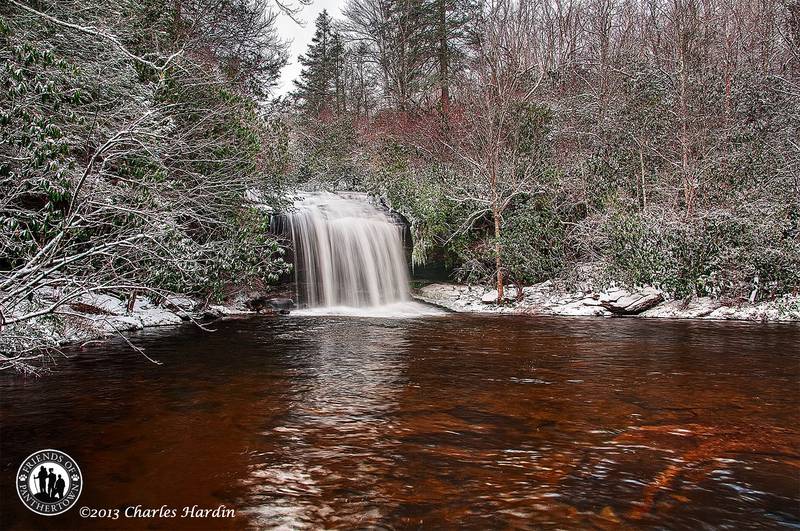 Photographer Charles Hardin shared with us this magnificent photo (above) of Schoolhouse Falls from his recent trip to Panthertown. Visit his website for more beautiful examples of his photography. Thanks, Charles! Watch these short video clips from a two-day camping/hiking trip earlier in February. The valley ended up getting about four inches of snow between Saturday afternoon and Sunday morning. Thanks to James Smith for sharing these video clips of his adventures. Would you like to share your photos and videos with us? Send us an e-mail or post a link on our Facebook page. The weekend of February 15 – 18 was the 16th annual Great Backyard Bird Count hosted by The Audubon Society and The Cornell Lab of Ornithology. The event was open to both novice and expert birders and some of them visited Panthertown Valley over the weekend to help keep count! This annual event benefits birds and encourages people to get outside and enjoy birding. Looking for more great photos and videos of Panthertown? Join us on Facebook, Twitter, and YouTube for the latest updates, photographs, and videos of our work in Panthertown Valley, and for the shared adventures of our members and other friends. We love to interact with our visitors, especially if you’re interested in helping us protect this incredibly special place. Thanks for supporting Friends of Panthertown!